A broken collarbone changes life temporarily. But little did I know my situation would have me seeing the light. Unable to climb the stairs to our bedrooms, a make-shift sleeping area was established for me in the living room with a nice big picture window. 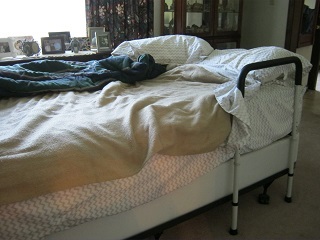 My bed. Plenty of room. Cozy & comfy. 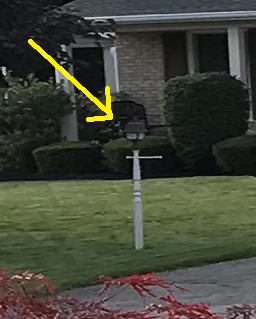 That is till my neighbor across the street put a new bulb in his yard light. Not just ANY bulb, mind you. But the all-night glare proves it must be military-grade, illuminating everything within three square miles. Prisons don’t have searchlights with this much wattage. And here I lay trying to sleep. It’s just an ordinary, mild-mannered light. But with the incandescence of the sun on steroids! Nikola Tesla would have to squint. And it blares through our living room window. All. Night. Long. It is so bright the right side of my face has 3rd degree burns. I’m thinking of sleeping in a welders mask. I can relate to french fries under the heat lamp at Burger King. Dog? Wolf, about to put me out of my misery? 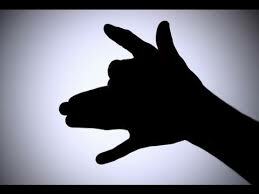 It’s perfect for making shadow puppets…UNDER THE COVERS! Who needs this much light? When my neighbor turns it on the whole damn neighborhood goes brown. It’s so bright even the moths have moved. Hey, Yankee Stadium called…they want their lights back. It’s keeping the astronauts awake on the International Space Station. 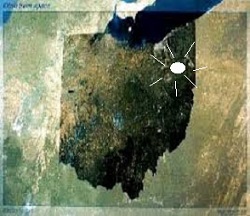 This light can be seen on satellite images of Ohio. And I’m trying to get some beauty-rest. I sleep while shielding my eyes. Which are closed. Sweet dreams my friend. I need a nap. Can you wear an eye mask? Now that would be too easy, right? I was just venting. Very sorry. Thanks for your solution. I can see why the light would have you thinking of a welding helmet lol. When it keeps you awake, it is the last thing you need. I hope your shoulder heals faster! Appreciate your kind words. I think I’ll survive this calamity! How good a shot are you?….